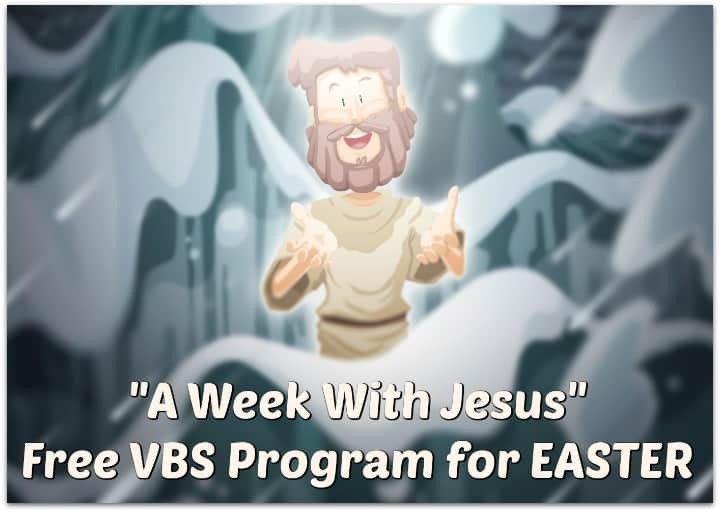 This is the 2nd part in a mini-series of lessons & activities for a one day Easter VBS event called “A Week with Jesus.” You can find the introductory materials about this event and the teaching materials for the opening ceremony here. In this post you’ll find the teaching materials for 2 of the activity stations. Jesus went to the temple when He got to Jerusalem. The temple was the center of town because it represented God living with His people. This is where the people would meet with God and where they would offer sacrifices to God to pay for their sin. When Jesus saw what was happening in the temple He got angry because the people had turned God’s house into a market. Jesus drove the merchants out of the temple to clean God’s home. The teachers in the temple were angry with Jesus (likely because they were getting money from the merchants). They were also angry because He captured the attention of the people. So, they started looking for ways to kill Him. AGES 6+– – Divide the group into 3 teams. Place 3 hula hoops on the floor so they are almost touching each other. Put 3 paper plate “coins” in each hoop. One coin for each team. The coins should have different designs for each of the groups (make coins by drawing designs on both sides of a paper plate) – each hoop should have one of each team’s coins. One player form each team at a time will walk around the hoops and at each hoop will turn over one coin….either their team’s coin or another team’s coin. The goal is to be the team with all 3 coins “heads-up.” Play a couple of rounds, letting different people play for their team. 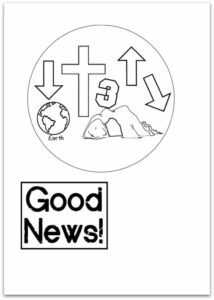 AGES 4-6– – Instead of playing the game, have them decorate “coins” by writing “good news” on one side of the plate and glueing one of the “good news coins” (download here) on the other side of the plate or drawing something they know about Jesus on the other side of the plate. Once they’ve made their coins, have them all flip their coins in the air. After each flip, point to one of the kids and if their coin says “Good news” the whole group should say “good news” and if their coin is the picture, that child should name one part of the good news (with your help)…. Jesus came to earth, Jesus died on the cross, Jesus rose from the dead and went back to heaven or one day Jesus will come back to earth. While they do the activity, chat about the significance of the temple. Talk about how the temple was the place where God lived with His people. Talk about how God’s people have lived with Him through history….in the garden they were physically with Him, but when they sinned they had to be separated from Him. Then, in the wilderness God had them build a tabernacle, which was where He would live with them, but because of sin they were separated and only one priest once a year could enter God’s presence. Then, Solomon built the temple in Jerusalem and God lived with His people, but they were separated from God by a curtain. Then, in John 1:14 we read that Jesus came to dwell (or tabernacle) with His people. God was living with His people. You might want to look ahead to Matthew 27:51 and talk about the significance of the curtain in the temple tearing when Jesus died. Jesus had gathered together with His disciples to celebrate Passover. Jesus took bread and broke it and gave it to the disciples telling them that it was His body broken for them. Then, Jesus shared the wine with them and told them that it was His blood poured out for the forgiveness of their sins. Jesus was taking one of the last times He had together with His disciples to remind them that they were sinners and that their sin needed to be paid for. He reminded them that the only way to pay for sin was for blood to be shed and told them that He would share His blood for them ~ He would give His life so they could live. Just a few hours later, Jesus’ body would be broken and His blood would be poured out as He died in our place. ACTIVITY: Snack- Recline and Eat…. After reading the story (or during the story if you want), have the kids recline around a table or mat and enjoy a snack as you continue to discuss this portion of the story. You should have baby wipes for kids to use to wash their hands before eating. Provide a simple Bible-times snack (flat bread, dried fruit, juice). As kids eat, talk about the significance of the bread and the juice. Chat about how in Christian churches today, we celebrate and remember what Jesus did when He died on the cross by eating bread and drinking grape juice together and that time is called communion or the Lord’s Supper. Have kids tell you about what they remember from when they’ve seen the Lord’s Supper. If there is extra time– – small group leaders may want to use this for a toilet break time. Tony Kummer (Editor) reviewed & updated this page on : March 14, 2016 at 9:39 pm. All our content is peer reviewed by our readers, simply leave a comment on any post suggest an update.